While it’s not uncommon to wake up feeling dehydrated, it’s not a great way to start the day. Waking up dehydrated can feel similar to dehydration at any time of day: you’ll wake up with a dry and/or sticky mouth, and you might have a headache and still feel groggy or tired, even though you got a full night’s rest. You could also feel excess hunger, and both dark-colored urine and constipation can also be signs of dehydration. Waking up dehydrated can happen for many reasons, the most obvious of which is that you simply aren’t taking in water overnight but are still losing it. However, there are several factors can play a big role in how much water you lose overnight and how dehydrated you might become. Hormonal balance plays a role in just about every aspect of health, hydration included. The body produces a hormone called ADH (antidiuretic hormone) anytime it senses that you are low on water, which tells the kidneys to absorb more water instead of producing urine. 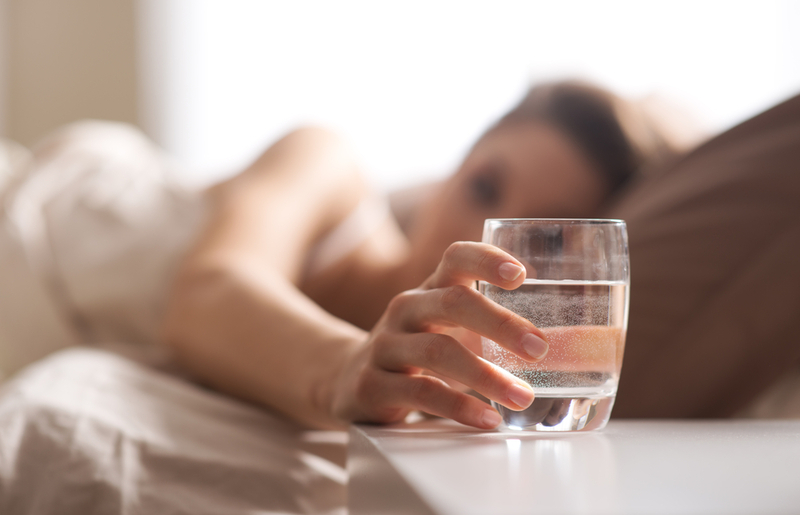 While this naturally happens more at night to combat overnight dehydration, studies suggest that as we age, the body might produce less of this hormone at night, therefore sending us on more nighttime bathroom visits, and leading to waking up dehydrated. In the body’s infinite wisdom, it naturally cools down at night to save energy. It does this through several mechanisms, one being increased sweating at night to maintain cooler body temperature. If you’re sleeping in a hot climate or heavily heated room, your body has to sweat more and loses more water, potentially leaving you dehydrated in the morning. When we breathe in, air is humidified and heated as it approaches the lungs, then some of this water and heat is expelled as we exhale. If you have a cold or are congested for any reason and breathing heavily out of only your mouth, you tend to lose more water. This is because nose breathing is one way the body ensures you lose less water. Just another reason why staying hydrated when you’re sick is so important! Another common condition that causes dehydration is diarrhea. In attempting to rid itself of the microorganism causing digestive upset, your body also expels important nutrients and liquids which can quickly lead to dehydration. As such, it’s important to relieve diarrhea quickly and safely. DiaResQ provides important nutrients and immune factors that work with the body to rapidly restore normal intestinal function and relieve diarrhea. Many people are mildly dehydrated simply due to inadequate water intake throughout the day, and this can easily cause you to wake up feeling dehydrated. Shoot to drink at least half of your body weight in ounces of water per day. You might also try drinking a glass of water before bed, but definitely avoid drinks with sugar or sweetened beverages, as these can potentially worsen dehydration. Often the solution to feeling hydrated when you wake up is simple, but it can require paying attention to your daily routine and making some simple switches. If you feel your morning dehydration isn’t improving and is becoming a problem, it’s never a bad idea to check in with your doctor. 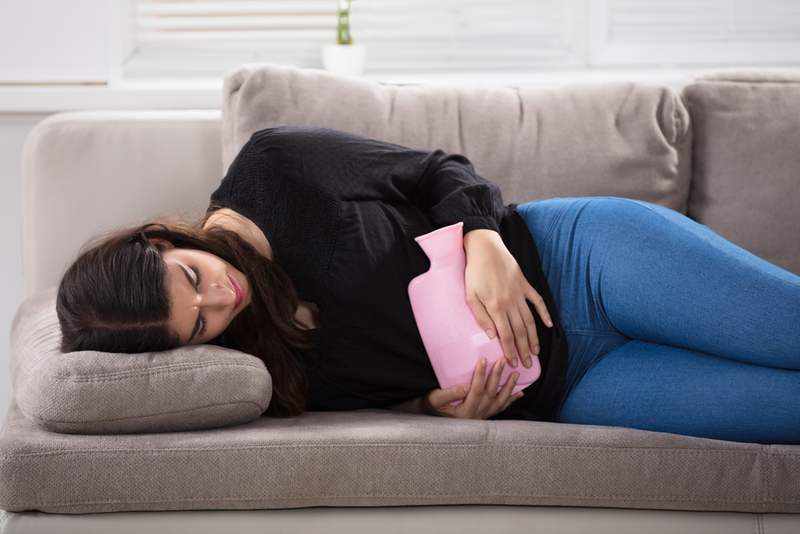 Can Your Period Cause Diarrhea?